A nurse, volunteer, and devoted community member, Yvonne Spencer-Elliott has helped improve health for countless people in Palm Beach County. Mrs. Spencer-Elliott’s nursing career began in 1978 when she graduated from Palm Beach State College. She went on to work at Doctor’s Hospital in Lake Worth for two years before she was hired by the Florida Department of Health (FLDOH). Her career at FLDOH lasted for 33 years where she worked in various nursing positions such as School Nurse, Immunizations Nurse, Triage Nurse and Clinical Supervisor. She assisted with immunizations in both the FLDOH outreach program and Med Mobile program. 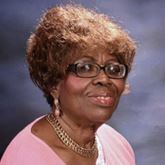 Mrs. Spencer-Elliott was assigned as School Nurse at Palm Beach Lakes High School from August 2009 to June 2011 before she retired. She says she enjoyed working with students and was able to be a nonjudgmental, good listener and also an encouraging voice to them. Mrs. Spencer-Elliott was nominated Faith Community Nurse of the Year in 2014 and participated in the Interfaith Health and Wellness Program of Catholic Charities. She attended the first Faith Community Nurse Course in 2005. Today, Mrs. Spencer-Elliott is an active member of Redemptive Life Fellowship Church, an Ordained Deacon, and volunteers as their Assistant Director of the Annual Community Health Fair. She collaborates with area doctors, nurses and health organizations to bring health services to the community and serves weekly in the Nursing Home Ministry. As an active member of T. Leroy Jefferson Medical Society, Mrs. Spencer-Elliott participates on the Health Fair Committee. In addition, as a Parish Nurse, she utilizes her professional nursing background as well as commitment to community involvement in fostering physical, emotional, spiritual health and social harmony. Since retirement she has filled her time volunteering at her church in the office. She has been married for thirteen years and has one daughter, and three grandchildren.